In simple terms, people need to believe that the system delivering the measurement is accurate otherwise they will refuse to be held accountable. For this reason you need to ensure you have a stable, repeatable Net Promoter measurement system and everyone knows how it operates. I’ve written before about how the survey approach and type can impact on the score that you generate. Your measurement system must stable, repeatable and consistent for every survey and for every recipient. Comparing a last month’s email survey results to this month’s telephone results is not reliable. Your process does not have to use any specific medium or survey questionnaire; just make sure that you don’t compare results from different mediums, survey questionnaires, etc. When building your system try to ensure that it cannot be easily “gamed” by staff. For instance having staff select, directly or indirectly, who will be surveyed is open to abuse. Somehow the email addresses of unhappy customers are mis-entered more often than happy customers. When you design your data collection process look out for situations like this where the process can be manipulated by unscrupulous employees. Ensure that you design out, as much as is possible, these situations so that everyone has confidence in the system. Remember that the process must not only be fair but it must also be seen to be fair. As with any new system it may takes several months, or even longer, to build trust in the measurements. Don’t try to set targets before you have this basic element of trust in place. If staff do not trust the score, they will not be motivated by the score. Ensure that everyone in the organisation understands what variation constituents “real” change in the underlying score. From a scientific perspective, measurement is a “quantitatively expressed reduction of uncertainty based on one or more observations” . Almost everyone has heard of the statistical terms “sample size” and “margin of error”. Generally, the larger the number of responses collected (sample size) the more confident you are that you know actual value of what you are measuring. Importantly for NPS® the sample size for a given confidence level is larger than other survey types. This is because to calculate NPS you subtract Promoters from Detractors and each of these measurements has uncertainty. So you need to take even more care with the statistics than normal. People need to believe that they can have an impact on the thing being measured or they will not be motivated. In the Net Promoter context this means that you staff must know what they can do and control to the affect the Net Promoter score. In essence you must have done some root cause analysis or identified some explicit cause and effect linkages between NPS and each person’s area of responsibility. This is not a trivial exercise but is a core step in the Net Promoter process. If as an organisation you do not know that is driving NPS, then you will not be able to methodically drive positive change in the score. Your NPS targets will be nothing more than lotteries, and lotteries are not a good way to run a company. On a side note: there are two general types of NPS survey approach: Business and transactional. Creating line of sight can be much more difficult when dealing with Business level results. With the large number of organisational units, staff, products and processes in most organisations, understanding how each is impacting on NPS is a difficult task. On the other hand transactional surveys lend themselves more strongly to gaining insight into what drives scores. This type of survey can be tied back to a specific transaction type or process and so the root cause analysis can be much easier. How to Measure Anything, Douglas Hubbard – by the way I heartily recommended this book as a general view on measuring business factors that seem to be unmeasurable. The real versus noise point is often harder to clarify as the sample sizes need to be quite large for NPS. But it is worth the effort as you say! 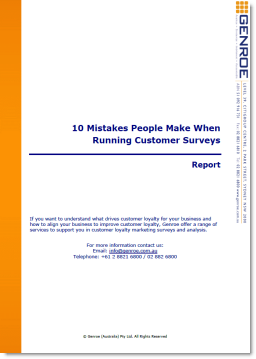 For example, to achieve a 5% margin of error if your customer base is 500,000 you need 768 survey responses. If you have 100 responses per month, NPS differences less than 11.8% are not significant i.e. they could be noise. Explains why you also need to pay attention to the qualitative aspects of the customer responses, unless you have large sample sizes (or small populations). You are very correct. The margin of error for NPS is larger than people expect because of the Promoter/Detractor maths. Thanks for dropping in some hard numbers for people.